This question seems to come up every so often. Yelstin wanted to bury him in the 1990s as a way to symbolize the transition from the old regime to the new one. The effort failed. It was seen as too soon. Too many people attached their lives and their national pride to Lenin. 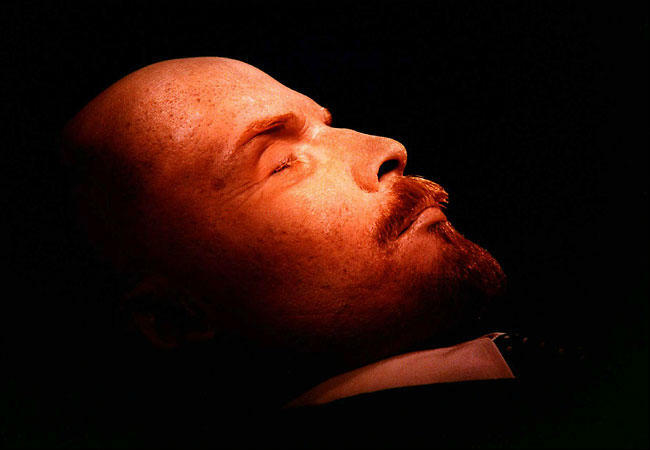 Putin has refused to move forward on burying him, rightly observing, “Many people in this country associate their lives with the name of Lenin. To take Lenin out and bury him would say to them that they have worshiped false values, that their lives were lived in vain.” Given the pageantry and recreation the Putin Administration put on for the 60th Anniversary of the Great Patriotic War (WWII for Russians for all those who don’t know), complete with banners of Lenin, Stalin and other Soviet imagery, Lenin as a symbol still has a place in post-Soviet Russia. I’m afraid, the issue is much more complicated than that. We would know this if more Russians were asked what they think of not only Lenin but the fact that his statue continues to be prominently displayed all over Moscow. The biggest towers across the street from metro Oktiabrskaia. The Soviet Union and its legacy remains a contentious issue for some. But for many it is viewed with an understandable ambivalence. It simultaneously figures as the best of times and the worst of times. There is nostalgia for many aspects the Soviet times, especially (and rather ironically because it is frequently associated with stagnation) for the Brezhnev period. I think what Lenin stands for is changing in Russia. For better or for worse, he is becoming more like Peter the Great: a firm and decisive, but necessary ruler who thrust Russia into modernity. But that is historical memory for you. A new historical narrative emerges at the moment of forgetting. Even the Lenins of the world can find their place in the genealogy of the present.